Sitelinks are automated links generated from your site, and are seemingly chosen randomly to be displayed in search results. They help users navigate to their desired content quicker, and this contributes towards a higher click-through rate. Google has had sitelinks for quite while now. But Bing is relatively new at this. However, Bing recently announced that they will now be rolling out 'enhanced sitelinks' for all users globally. 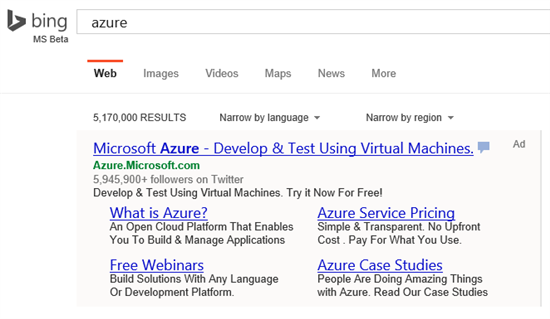 Now, Enhanced Sitelinks has been rolled out to Bing Ads customers in all markets, worldwide. Bing’s initial pilot of Enhanced Sitelinks found that the feature was showing an average of a 27 percent increase in click-through rate (CTR) for those advertisers using the service. Bing’s Enhanced Sitelink allows advertisers to "add two lines of customizable, descriptive text to your Sitelink Extension." The addition of Enhanced Sitelinks enables advertisers to provide their potential customers with additional details about their products/services and has been shown to improve CTRs. You must understand, however, that there is no guarantee. Even if your ad is eligible, Enhanced Sitelinks are not guaranteed. The deciding factors include relevance of ad, relevance of the included Enhanced Sitelinks, space available on the SERP page, and the user location. According to Bing, "Only high-quality ads serving in the top position in the ad block above the algo results with trigger Enhanced Sitelinks." This means that Enhanced Sitelinks efforts should be focused on your top-performing campaigns. Your Sitelinks should be no more than 25 characters in order to be eligible. If your Sitelinks are more than 25 characters you must first shorten the Sitelink and then add your description text. Thanx for this another helpful piece of article.